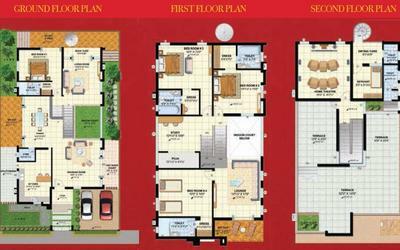 How Far is Vajram Aster Homes? Aster Homes is Both Grand And Spectacular. An Address That’s Complete In Every Aspect.The Independent Villa Comes To You Equipped With All Modern Amenities. Besides, It Is Spacious Enough To Accommodate All Your Dreams. In Short, Your Prefect Destination To Spend Your Entire Lifetime At, As Happy Memories Glides By. Vajram Constructions Private Limited, a construction company was floated in the year 2007. Till date we have completed Seven Apartment Buildings in Hyderabad. We now proudly announce our flagship project "ASTER HOMES" in Gopanpally, Near Financial district in Gachibowli. It is a prime property on a 100ft road adjacent to an upcoming radial road connecting the property to ORR. 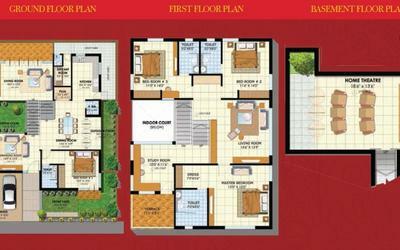 The property is close to Hospitals, the new corporate Schools and Engineering colleges. This project has 47 villas exclusively designed for comfort, exquisite ventilation and to make your dreams come true. Main door with teak wood frame and teak wood shutter with Dorset hardware or equivalent. Internal doors with teakwood frames and designer flush doors with Dorset hardware or equivalent. Teakwood frames and shutters with glass panels or UPVC window systems of Fenesta / Rehau or equivalent with elegantly designed MS grill. Texture paint of Asian paints/ ICI make or equivalent. All rooms with marble flooring / 24" X 24" Vitrified tiles with 3" skirting. 24" X 24" Vitrified tiles with 3" skirting and upto 2' height dado above platform. Bathrooms and Powder Room: Anti- Skid tiles with designer flooring and dado upto 7' height. Utility: Anti- Skid ceramic tiles with dado upto 3' height. All tiles of RAK, Nitco make or equivalent. Modular kitchen with polished granite top cooking platform with stainless steel kitchen. Provision for fixing RO system, exhaust fan or chimney. Copper piping for gas stove from external cylinder storage area. Well planned toilet layout with wet & dry areas as far as possible. Wall hung EWC with flush tank and counter wash basins. All bathrooms have Hot & Cold wall mixer with shower. Master bedroom is provided with bath tub. 300 liters Solar water heater with built-in electrical backup heater on terrace. ISI mark of PPR/ UPVC/ CPVC piping for water. ISI mark of PVC/ SWG sanitary piping. Ceramic ware from TOTO/ American standard or equivalent. CP fittings from Grohe/ Jaguar or equivalent. Ample power plugs for kitchen appliances. 100% power backup through generator (Chargeable running cost) for all electrical points. MCB's and ELCB of MDS make or equivalent. All electrical modular switches and sockets of Anchor, Legrand or equivalent. Intercom connection to all villas. TV points in all bedrooms and Family rooms.